Mostly low cost cards. 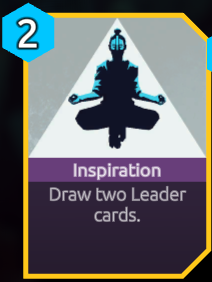 This is why it includes Inspiration I guess. The starting deck is quite good, and will allow you to kill early enemies without too much trouble. 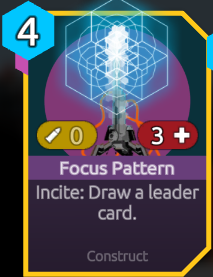 Probably as good as Firebrand starting deck. Pull-Push - surprisingly good utility cards. Pull is a good amount stronger than Push since it can be easily used to block the 1st column with an obstacle. Scratch - decent direct dmg. Blackout - useful utility card. 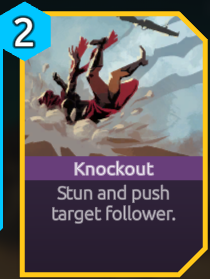 Bolster - "ok" buff card. its a bit small but still useful in many situations. Backstab - Very strong DD card. Inspiration - Very weak card in general, but it fits into such a low cost deck. Is good if you have Hedgehog Drone Permanent. I deleted this card after a while. Shot - decent direct dmg. Blind Shot - Very strong removal card. 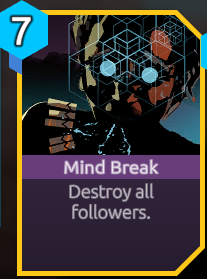 Mind Seize - I don't understand why this card is in this deck. Its a pro-Drone card. Seems a bit strange to find this in the card list of a non-Ruster class. 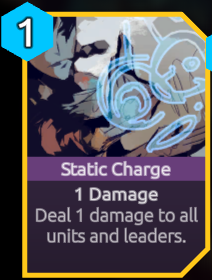 I see Ruster enemies using this card. It is pretty low dmg and will hit your followers too, making it pretty bad. It also does not help you against Rusters, which is one of the enemies that build up followers the fastest. 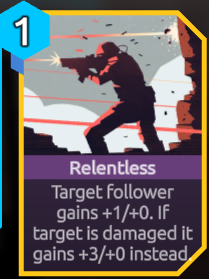 I deleted this card after a while, because it was basically never useful in the situations i was in. Pretty good card if you draw it in your opening hand. Very bad. Is good if you have Hedgehog Drone Permanent. 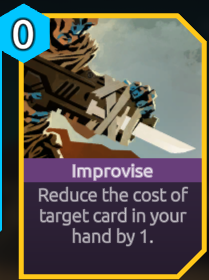 "ok" card for most builds. I don't get super excited about it. Better in enemy decks. For us, its not as exciting. We usually have board control. It is good if the enemy is crushing you. However, you will probably use up all your momentum, and then the enemy will still take board control again next turn. Very strong DD. good cost-to-dmg. 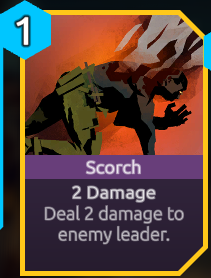 Pretty good buff card. Many times you will have hurt followers to use it on. Very strong. You only really want one of these. Could be good, but is pretty expensive to play. 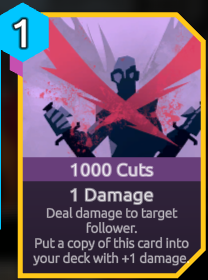 Not sure how this construct works if 1000 Cuts is the only card left in the deck, if it draws first and you take dmg, or if the copy is made first and then drawn. Either way you would take dmg the next turn anyways. 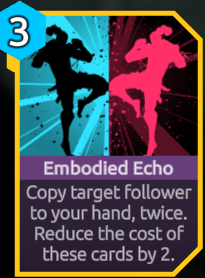 Good buff card, even though it can buff enemies. 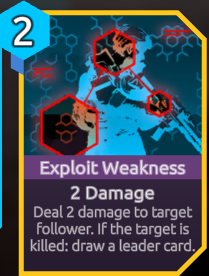 Weak card. Doesn't help you maintain board control. Does little dmg. 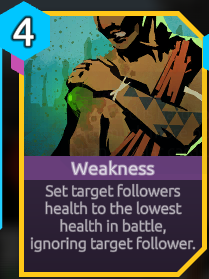 Weak card. Weakness is weak. hehe. 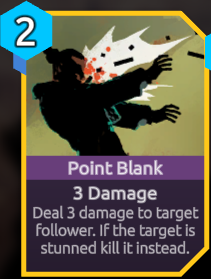 For 4 momentum you can usually just kill an enemy with a DD card. 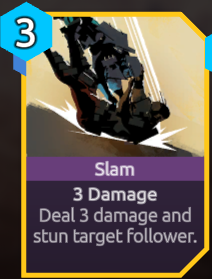 This card at most debuffs the enemy. Maybe it kills the enemy if its the only card on the board, but that is a very unlikely scenario. 4 cost is just very high for an HP debuff. 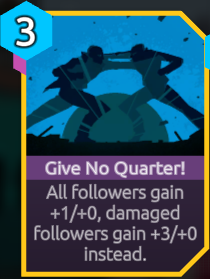 If you have good followers on the board, this card becomes totally useless as a debuff even. Weak Mythic card. The cost is high and the effect is only situationally good. 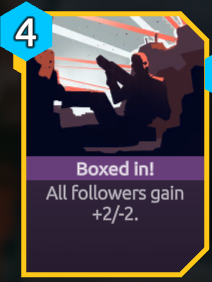 Pretty good mythic. This new version is a lot better than it used to be. 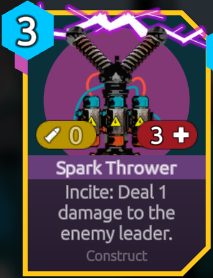 Pretty good mythic. 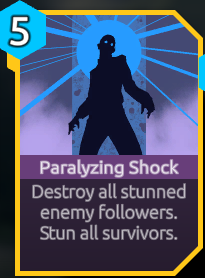 It works well if you already have board control and can now use your followers to clear the stunned enemies.